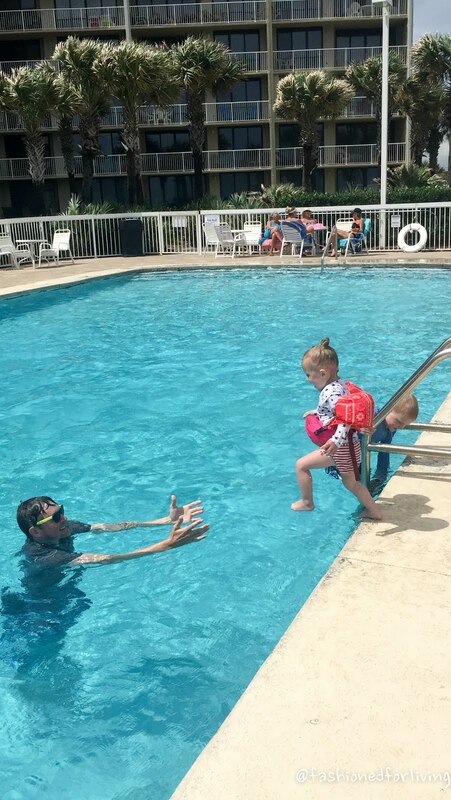 Vacations can be stressful and getting to the picture perfect moments like shown above can be a lot of work for mom and dad....rest and relaxation goes out the window! Our son (Everett) will be six in July and our daughter(Elliot-Ellie for short) just turned two. 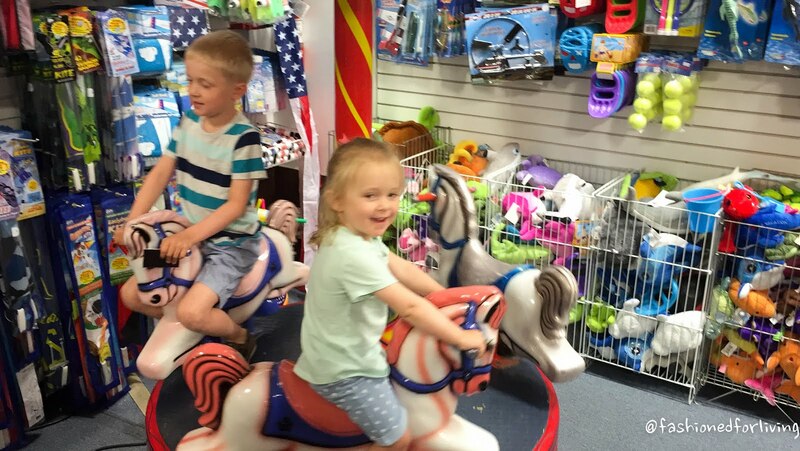 Elliot enjoys free play time and has less patience with organized activities as most kiddos her age do! 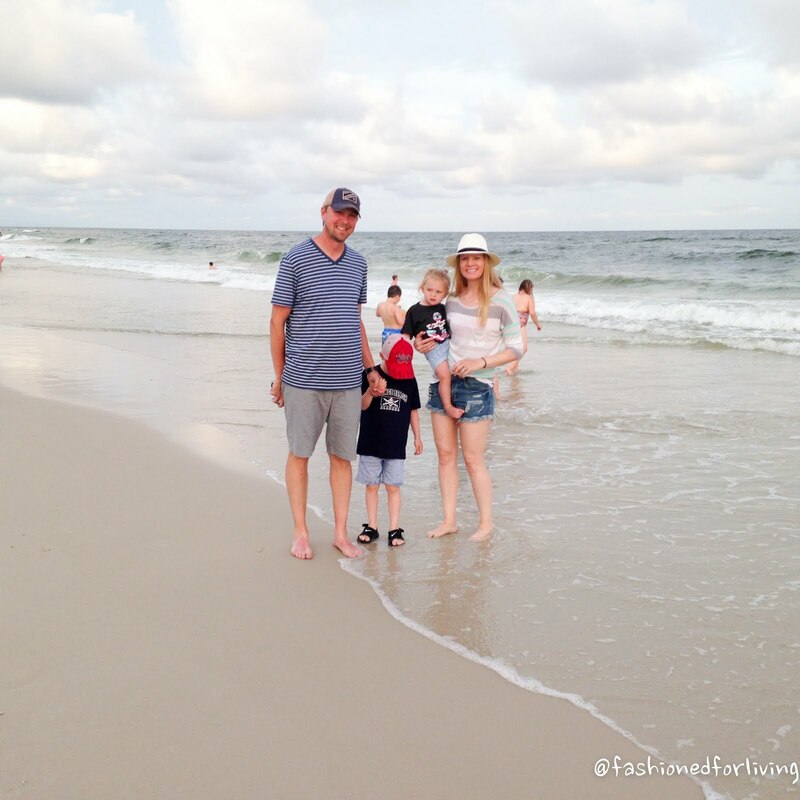 We had all of this in mind when we decided this year would be perfect time for a beach trip! 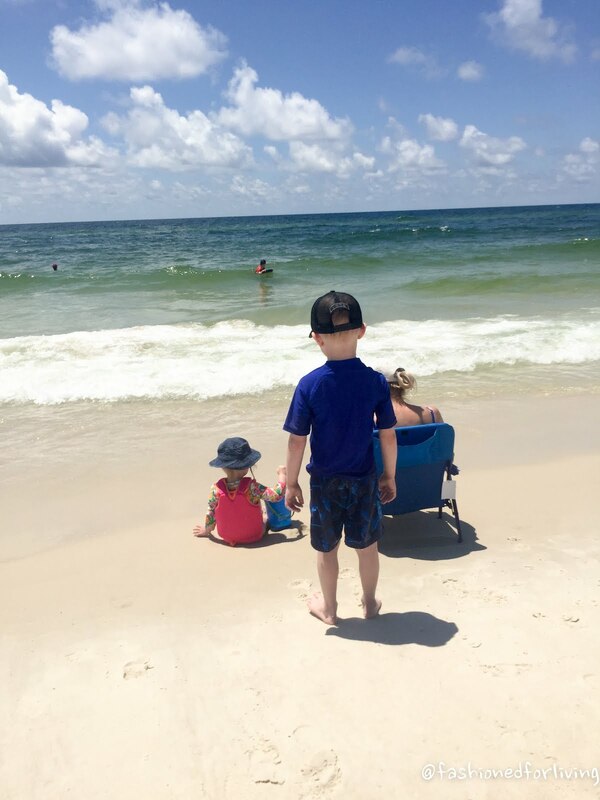 Gulf Shores, Alabama is the nearest beach to Missouri wear we live, and my husband had been several times growing up. We planned to go sometime in the later part of summer, but after looking at our calendar realized that would be difficult to fit in. 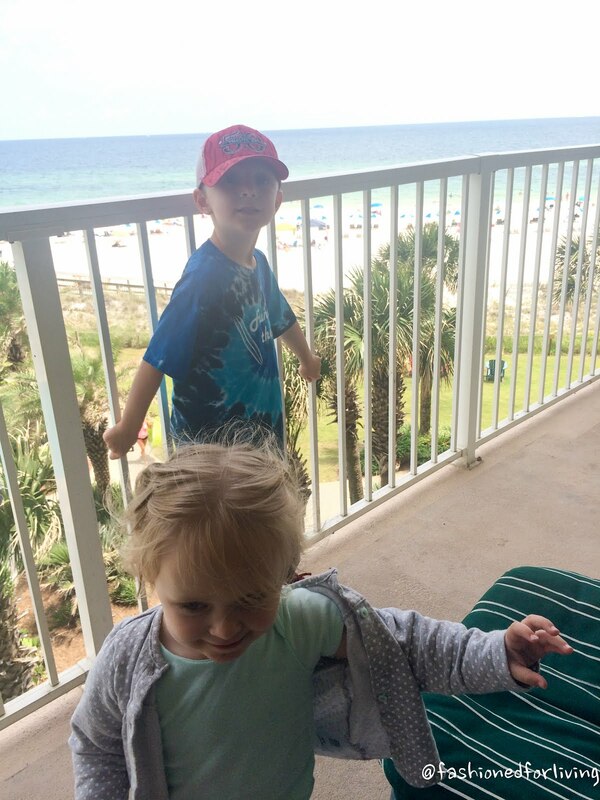 SO, on a Saturday morning we booked a two bedroom/two bath condo at Seaside Beach and Racquet Club for five nights starting that Wednesday... we would leave Tuesday evening after Everett's T-Ball and drive all night! Nothing like waiting until the last minute! We also decided to take my mother-in-law along. There was plenty of room so why not! Time to start packing! For our kiddos I like to lay out complete outfits and then put them in zip lock baggies with socks and underwear. This works great for saving space in the suitcase. 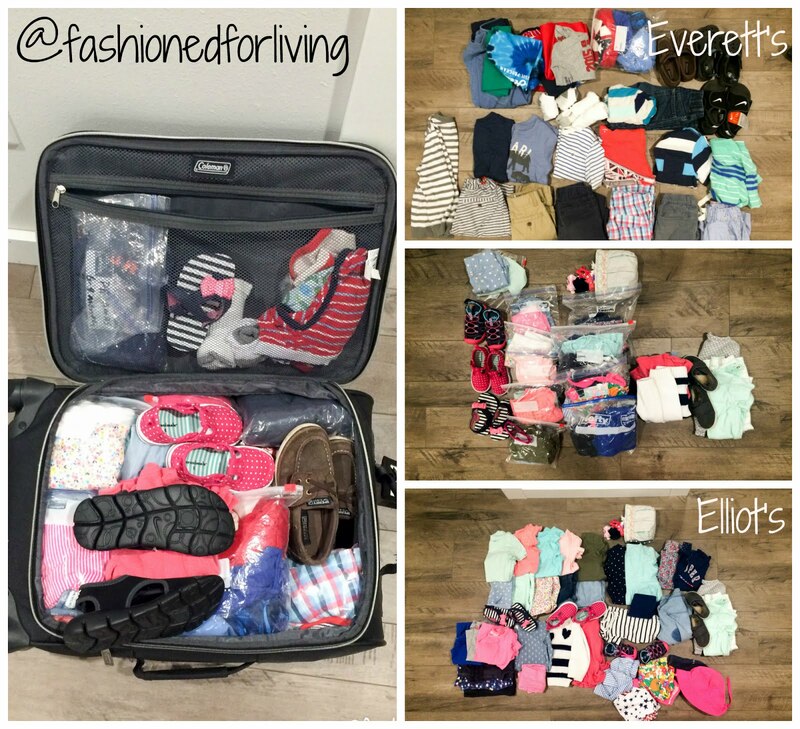 I also love it because I can easily sort through the suitcase without completely mixing everything up and hand my sweet hubby or son a complete outfit in a bag for easy dressing. No more of "what goes with this"! 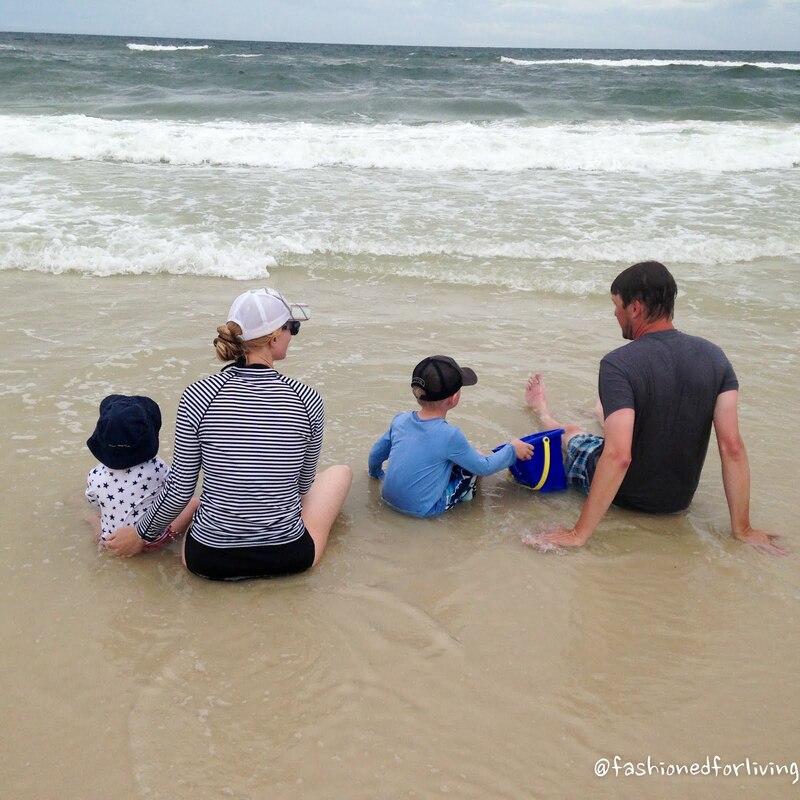 I mainly packed shorts and tees, jammies, and one cold weather outfit for each kiddo...and of course beachwear. I will spare showing the ridiculousness of my suitcase instead I will show you what I actually wore throughout the trip! Hopefully this will help you and me! 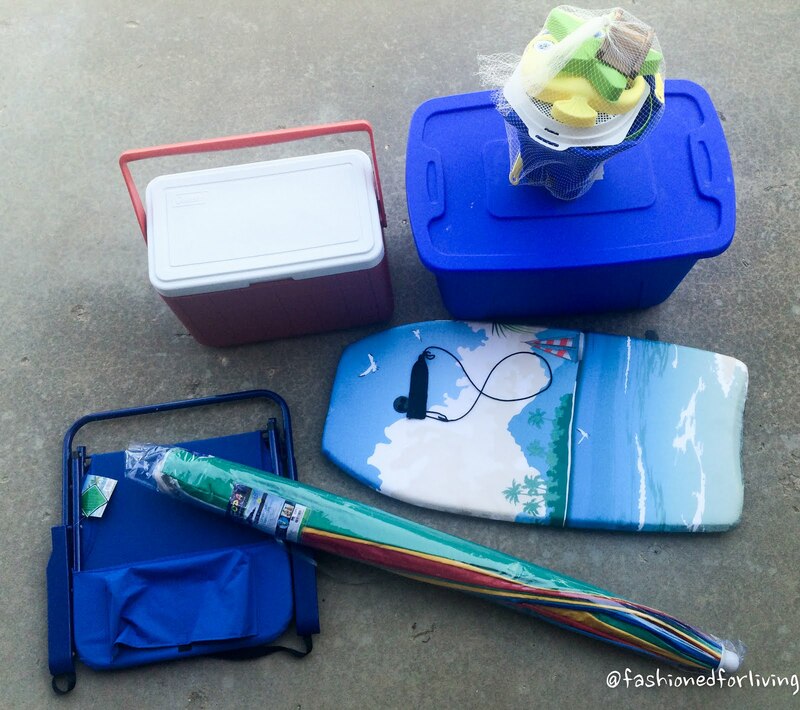 For the beach we brought a medium sized cooler, a large tote, a beach umbrella, a boogie board, and beach chair. Well, we actually purchased the chair and boogie board from Walmart once arriving at the beach. But necessities nonetheless! The beach umbrella is from Big Lots (couldn't find online), I noticed several of the souvenir shops carried beach umbrellas of similar quality. And, you can always rent one at the beach. It did the job and held up well under some fairly strong wind, but at $25 not sure how long it will last. We also purchased from Big Lots this waterproof phone case you can capture photos and video while using. 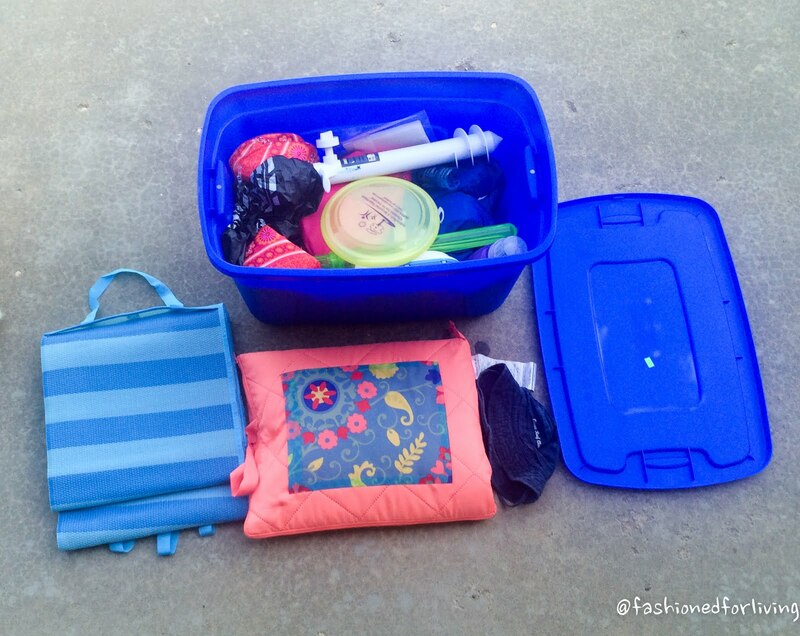 The tote housed life jackets for the kiddos, umbrella base, a couple small floats, bubbles, laundry soap and dryer sheets, and two beach blankets. We brought my son's life jacket(like this one) which is an approved floatation device. 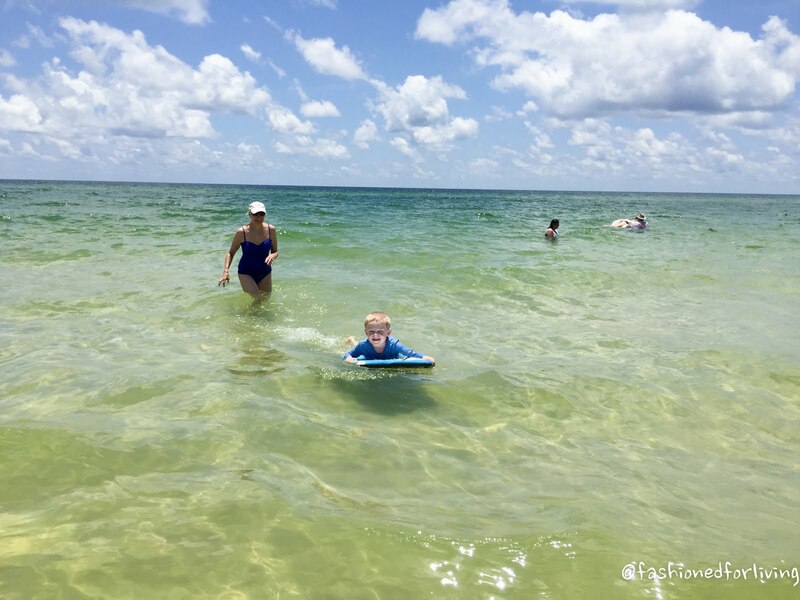 For my daughter we purchased both a swim jacket (click here) for the beach and a tot swimmer (click here) for the pool and we ended up using both everyday. The blue woven beach mat (click here) is from Big Lots and it worked ok. 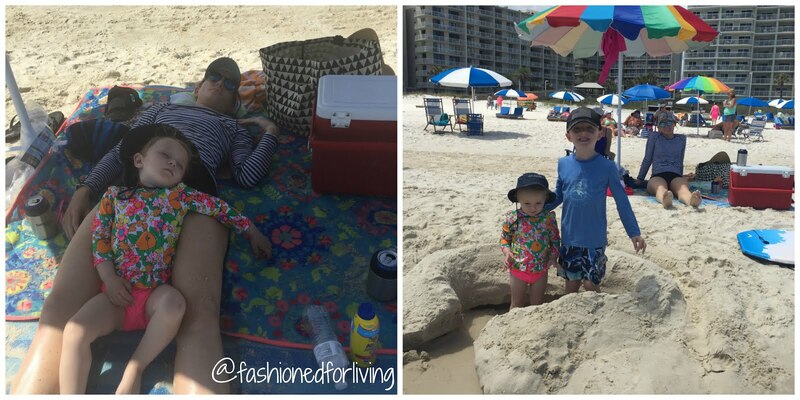 The coral blanket (click here) is from Walmart for 13 bucks and worked awesome. 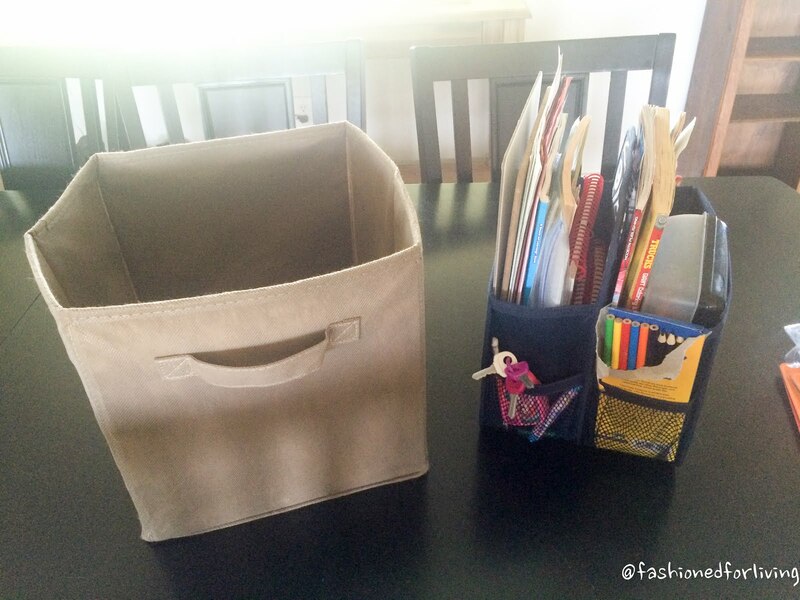 It zips up into a neat square with a carrying handle. For the car I packed the brown tote with our favorite snacks and also brought this Thirty-One caddy(click here) filled with sticker books, crayons, water wows, coloring books, and a couple of favorite reading books. They both fit nicely on the floor behind the driver seat for easy access. We also brought movies for the DVD player. The kiddos and I each brought a pillow and a favorite blankey. Tuesday, at around 9 pm we pulled out of our driveway picked up my mother-in-law and headed for the beach! This was our first stop for food and to stretch our legs! AND COFFEE!! Room to spare in the back there, dear...wink,wink! 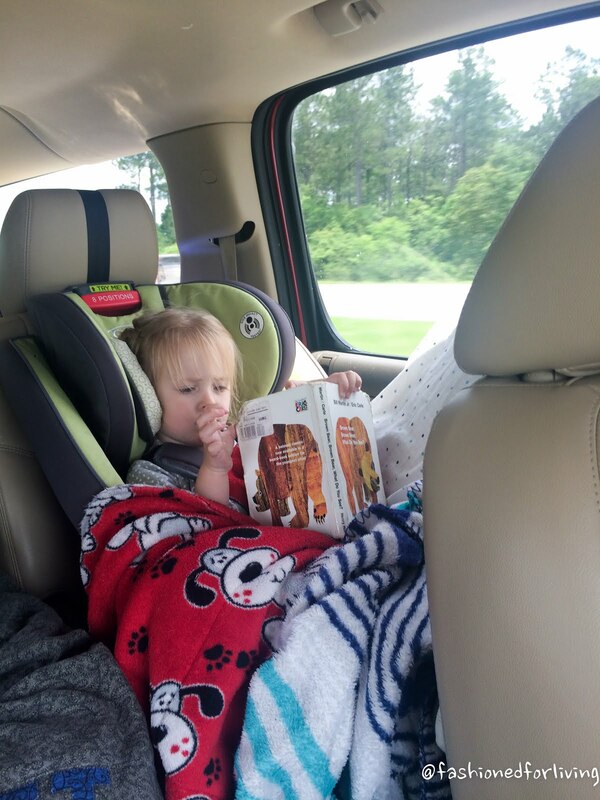 Elliot had been rear facing until a day before the trip, she really enjoyed being able to see what was going on up front! We made great time with the kids sleeping pretty much the entire way! 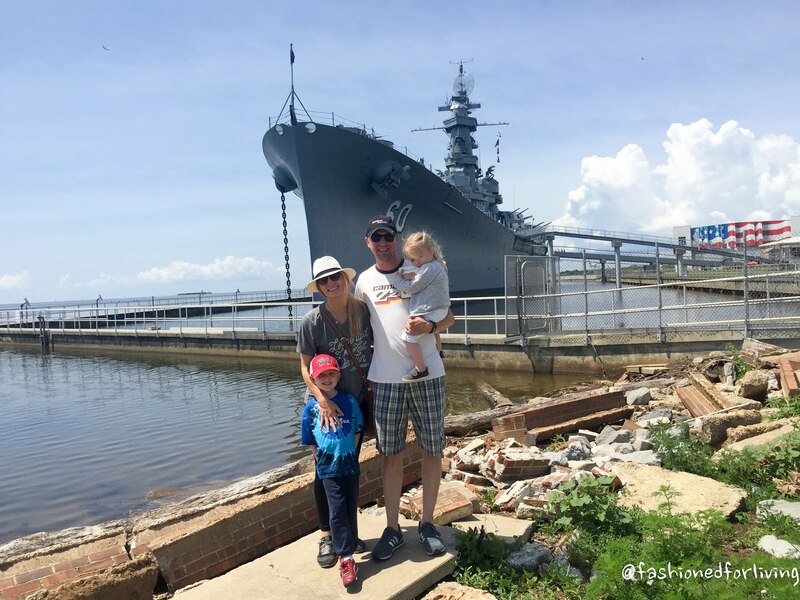 Decided to stop in Mobile at the USS Alabama Battleship Memorial Park(click here for more info) to burn some time before we could check into our condo. I believe it was two bucks a vehicle to park and tour the grounds. The gift shop associate told us it would take several hours to complete a self guided tour of the ship, which is an additional fee per person. So, we decided after driving all night we were not up for it! Maybe another time. 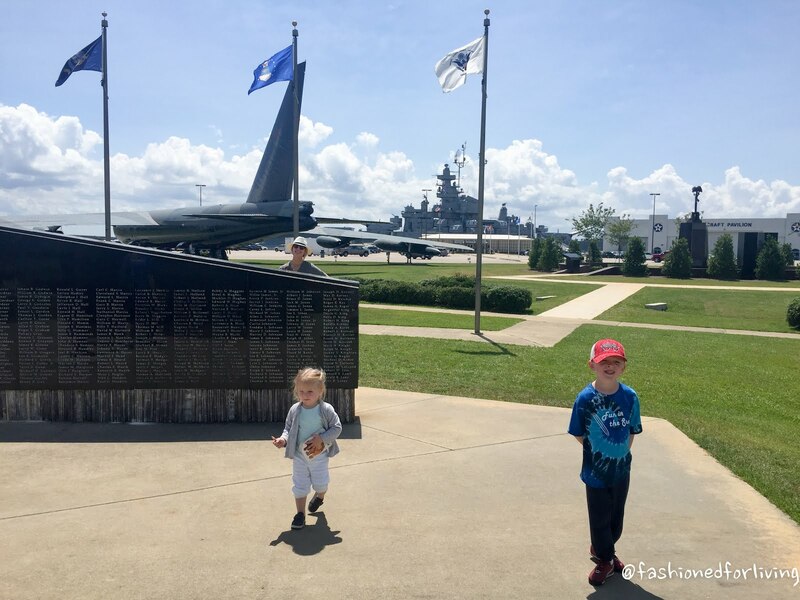 There were lots of military vehicles (planes, tanks, helicopters, etc..) to look at on the grounds and several different war memorials. One of my favorite memorials was this one, dedicated to all the dogs that have served. Wohoo!! See the ocean on the navigation!! Almost there! 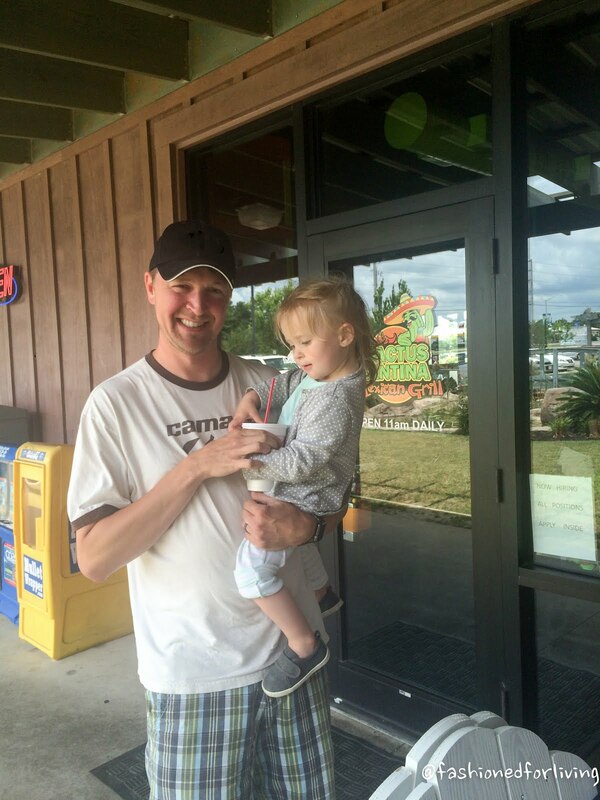 It was lunch time when we arrived at Gulf Shores so we pretty much stopped at the first place we saw which was Cactus Cantina Mexican Grill. It did the job and then we went on to Meyers Rental to pick up our keys to the condo! We were able to check a couple hours early. Whoop! Whoop! We made it. First look at that view!! 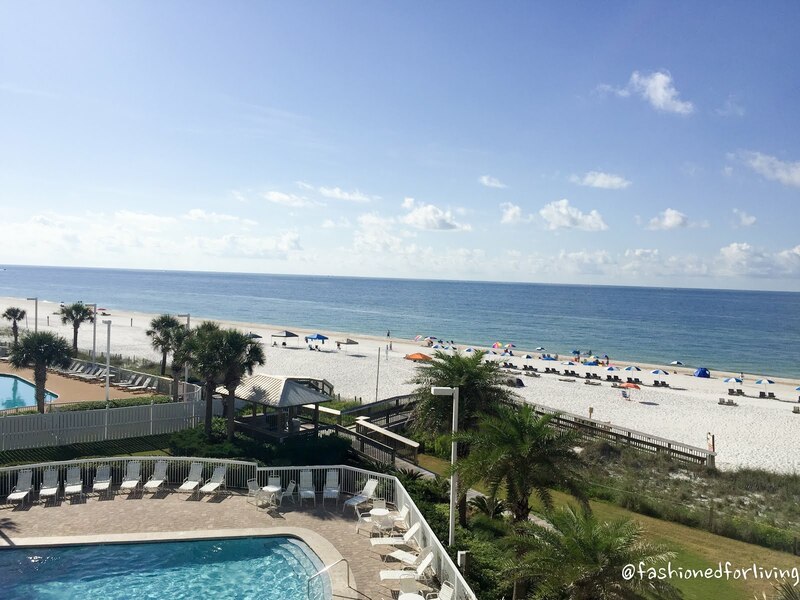 One of my favorite things about Seaside Beach and Racquet Club is it is not a high rise, we stayed on the 4th floor, had a fabulous view of the beach and could also see the pool. I could easily see my family in the pool or at the beach from our balcony. All our stuff! Sorry, not sorry. Forgot to mention we also brought a tripod and camera, pack n play, and of course a big beach bag full of towels. After unloading all the stuff in the condo my MIL stayed with the kiddos and we ran to Walmart which was super close to pick up breakfast and lunch stuff....beer and wine!!! Duh! 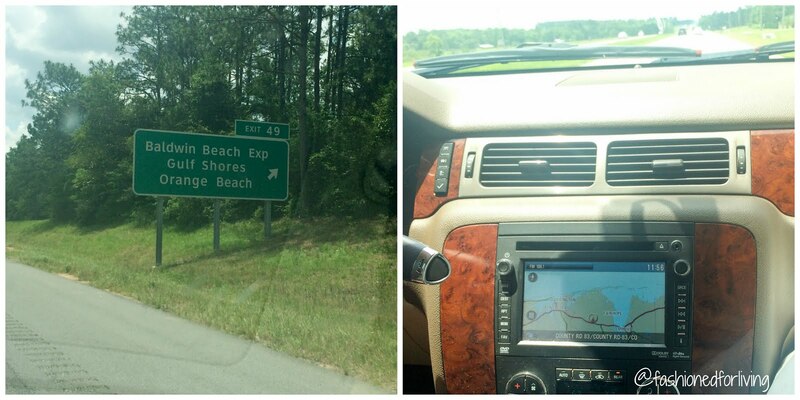 Then we hit the beach! A passerby told us we looked like a "nice patriotic family". :-) The first night for dinner we cooked a frozen pizza and went to bed early! First thing the next morning, we went literally across the street to Adventure Island. P.J. 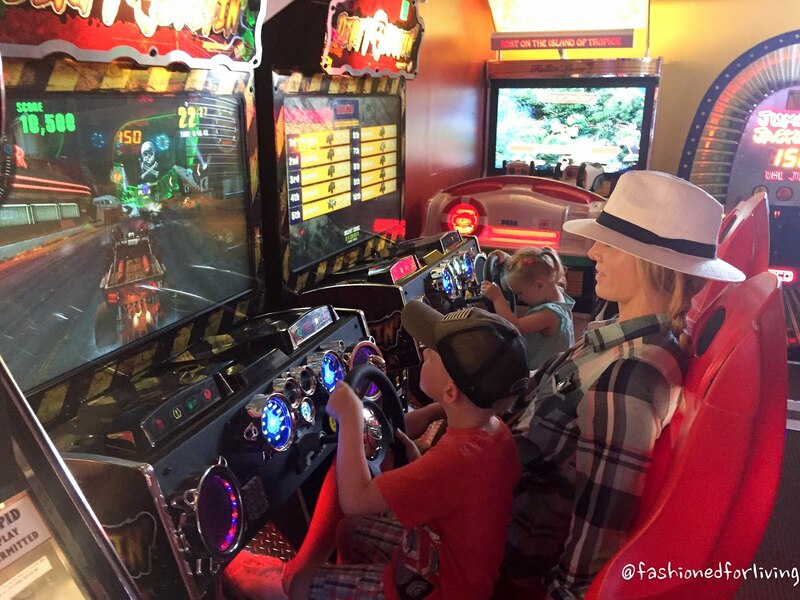 and Everett rode go carts and played a couple of the many arcade games that were inside. Everett was a bit small to ride the bigger go carts, but they also had these smaller ones he could drive. Which he loved. I had to push the pedals! Had lunch and made our way down to the beach! The water was so clear and gorgeous, but towards the end of our trip Tropical Storm Colin was making its way in and the water became foggy. The waves got bigger too, and riding waves was our favorite! I was worried about nap time for Elliot, but she happily took a nap on the beach everyday. We set up as close to the ocean as possible! First night out we ate at Tacky Jacks (click here for more info). 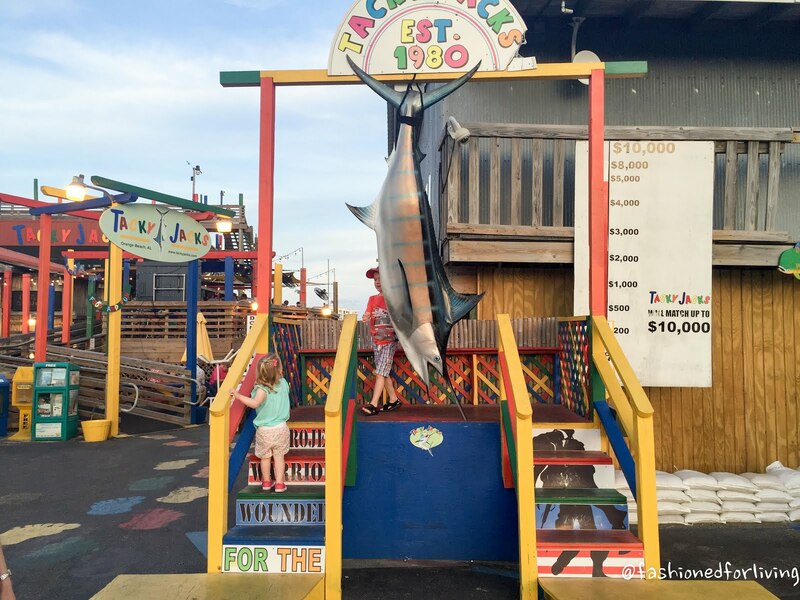 Of the restaurants we ate at on our trip, Tacky Jacks was our least favorite. It was a neat atmosphere being on the water, but the food was just ok for the price. 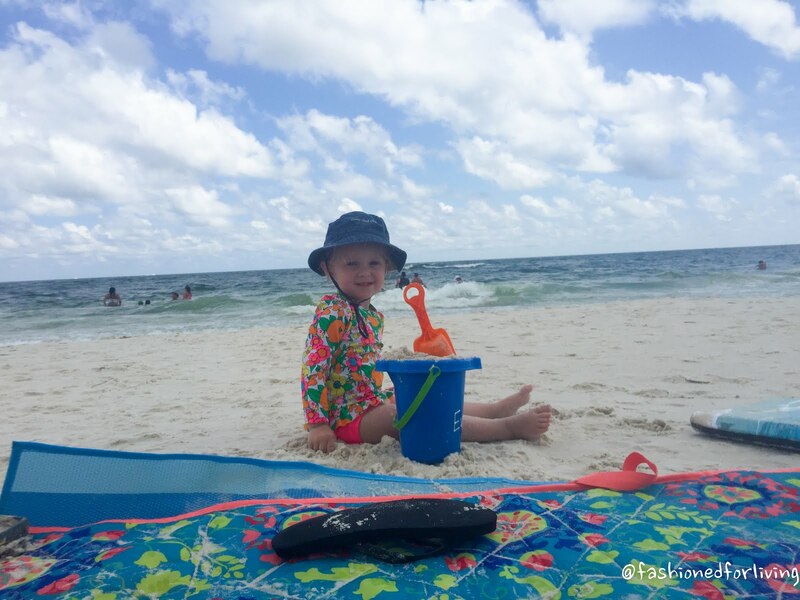 Ellie was happy as a clam scooping sand in and out of that bucket! SO, we saw lots, and LOTS of folks parasailing. I've probably watched Dateline and 20/20 too much, but I was not a fan of my little guy partaking. 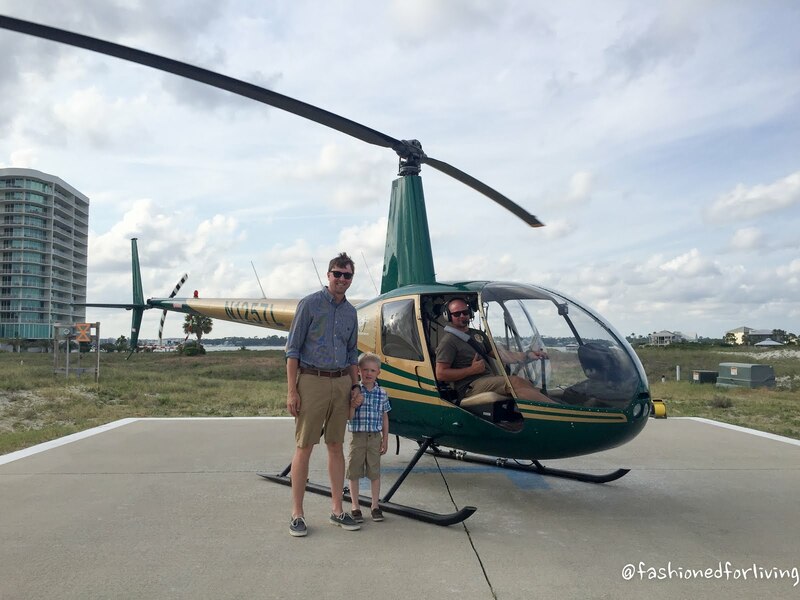 We opted for a father and son helicopter ride (click here for more info) instead. 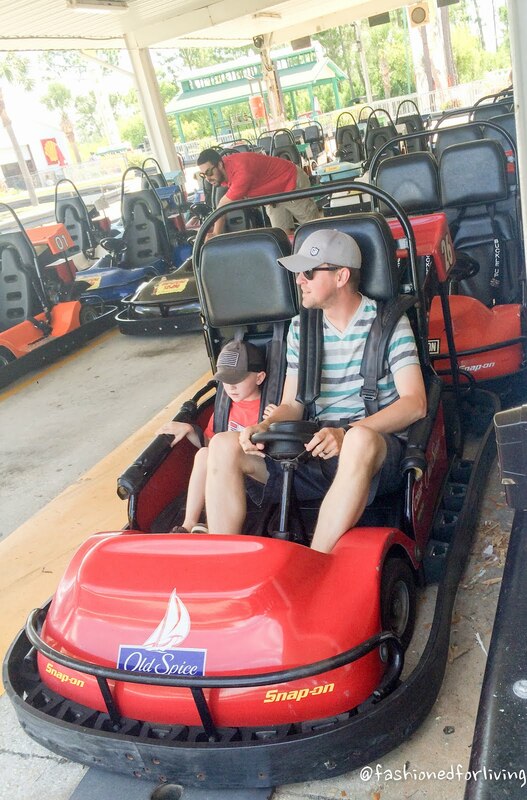 Everett was a little hesitant at first, but ended up really enjoying it...dad did too, of course! The ride went right in front of our condo. Shot P.J. 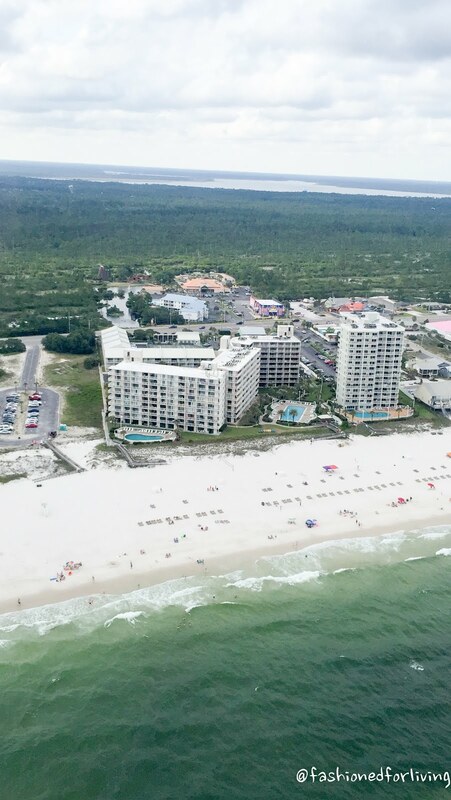 took with his phone from the helicopter ride of Seaside Beach and Racquet Club. 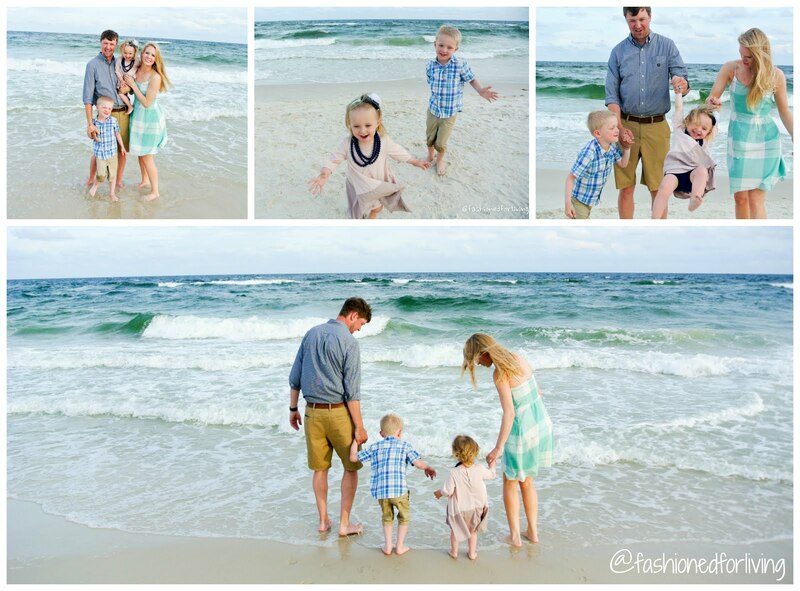 After the boys got back from the helicopter ride we went down to take pictures on the beach. We used the tripod and remote to take pictures that included my MIL, and she took these picture using my Nikon camera. We saw several folks that used professional photographers as well. I am very happy with how ours turned out! If attempting on your own wait until an hour or a little less before sunset otherwise know as the MAGIC HOUR. There's a app called "Magic Hour" that tells you the best time to take pictures based on your location if you're not sure. Keep the sun at the camera's or person taking the pictures back, and start snapping! Take lots! 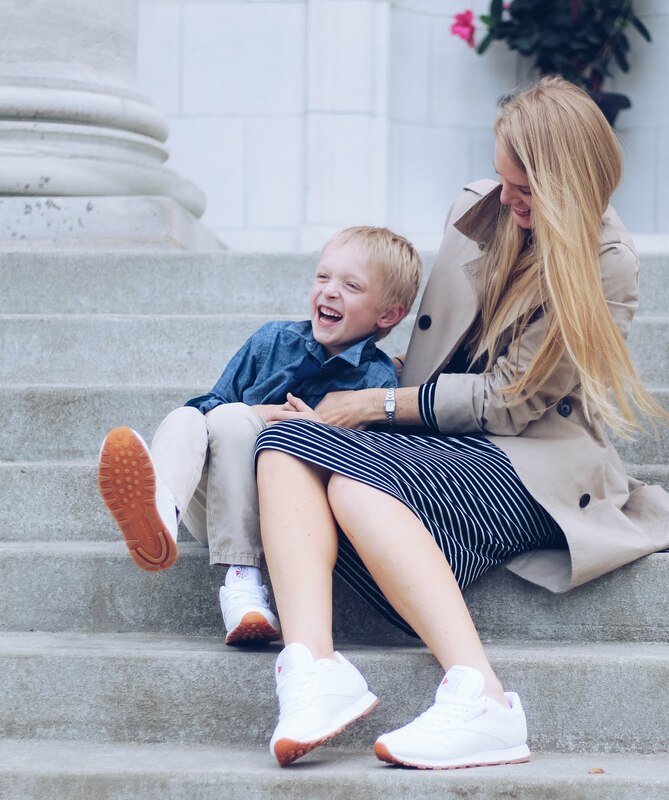 The more natural and less posed type shots are my favorite and are usually easier to make happen with kiddos. We also used a iPhone to take pictures that turned out pretty great as well...if a camera seems too intimidating something to keep in mind. 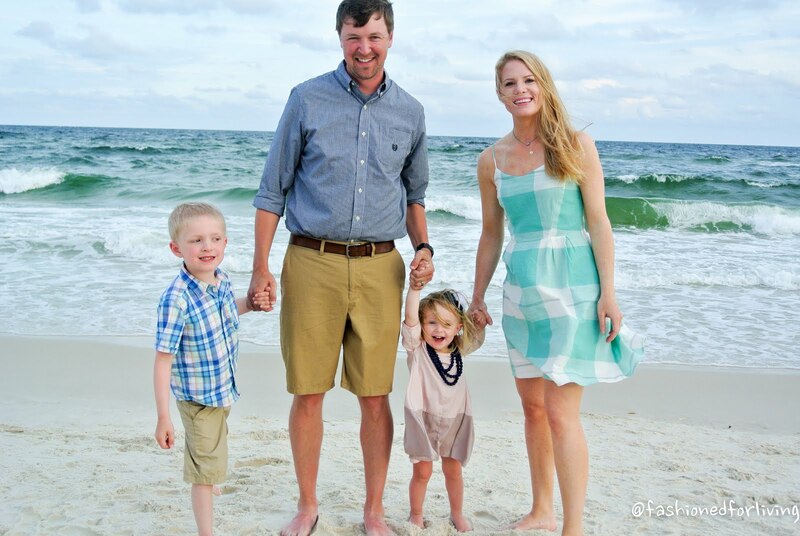 The beach is such a beautiful backdrop you pretty much can't go wrong! That night we ate at Cottons (click here for more info). Sorry, we didn't get any pics of us there! It was reasonably priced and delicious. P.J. loved the steak, and I ordered crab stuffed shrimp that were very yummy! It rained on and off most of Saturday, but we made the best of it spending a fair amount of time in the indoor and outdoor pool. Everett and Ellie loved jumping off the side to P.J. We did eventually make it down to beach in the afternoon, but it was so windy and cloudy we didn't mess with the umbrella. Saturday night my MIL offered to watch the kiddo so we could have date night! We ate at Cayman Grill (Click here for more info) which was by far our favorite place to eat! !...and not just because it was the two of us. The decor and atmosphere are more modern, the food was excellent, and the staff was great! P.J. ordered the fried soft shell crab and I ordered grilled shrimp, both seemed fresh and were cooked perfectly. After dinner, P.J. 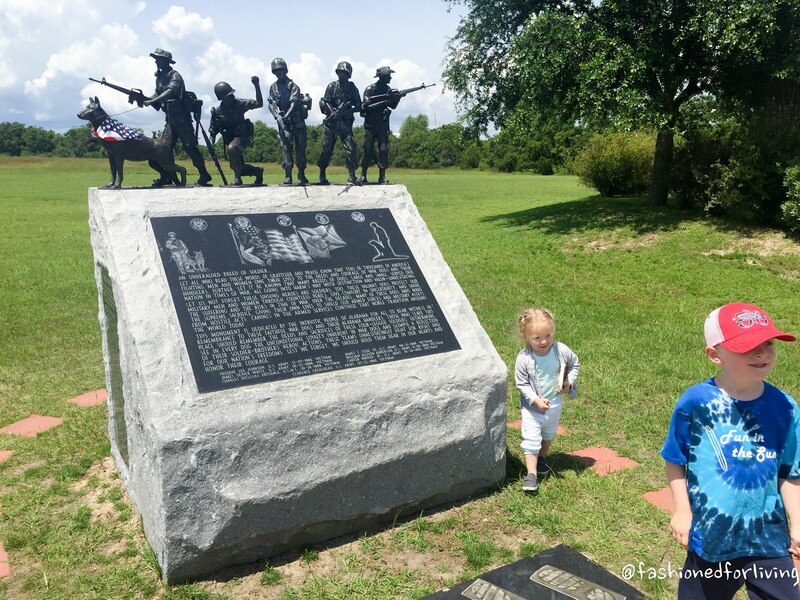 wanted to check out Flora-Bama(click here for more info), his brother told him it was must see. Think of your favorite college bar on steroids. There are several stages with live music, many different levels, and bars throughout! We had a beer and made our way through, and decided we might be too old, sober, and on a family vacation for that kind of shenanigans!! Made it back to the condo by 10!! Just living the dream! A bit of rain greeted us Sunday morning, so we decided this would be the perfect time to hit the souvenir shops. The above picture was taken inside Souvenir City (click here). This shop was right by our condo, and if you visit its neon pink on the beach side of the road. It was the most expensive of the the shops we went to. We also visited Surf Style and Alvins Island(click here). I recommend checking one of those places first if you are looking to score a deal on tees or hats. 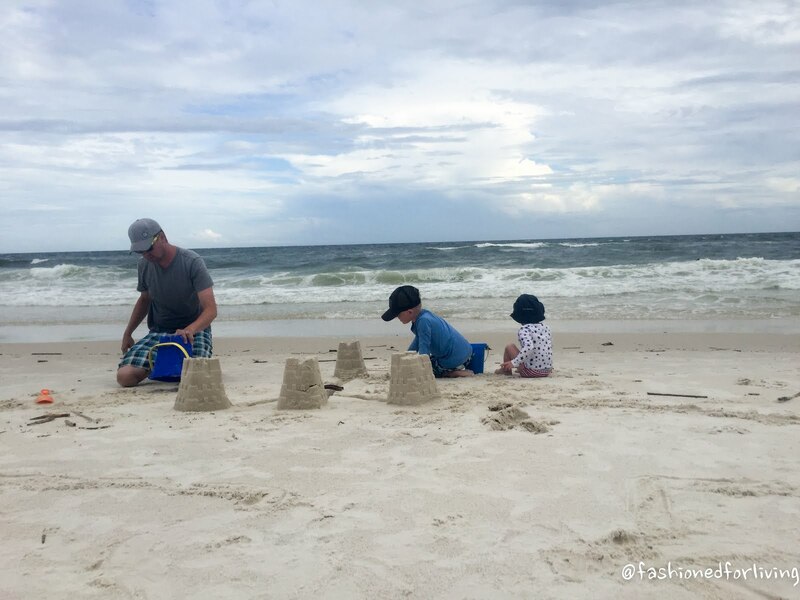 The weather cleared a bit and we were able to spend some time on our last day(tear) at the beach playing. Tropical Storm Colin was rolling in and the waves were huge. We put life jackets on the kids and rode some waves. There was a red flag out and we had seen someone get rescued the previous night so we were careful to stay close to shore where we both could still touch. Elliot, my daredevil, absolutely loved it! Cleaned up from a day at the beach and took a evening stroll. I loved hunting for shells, which there were lots of! 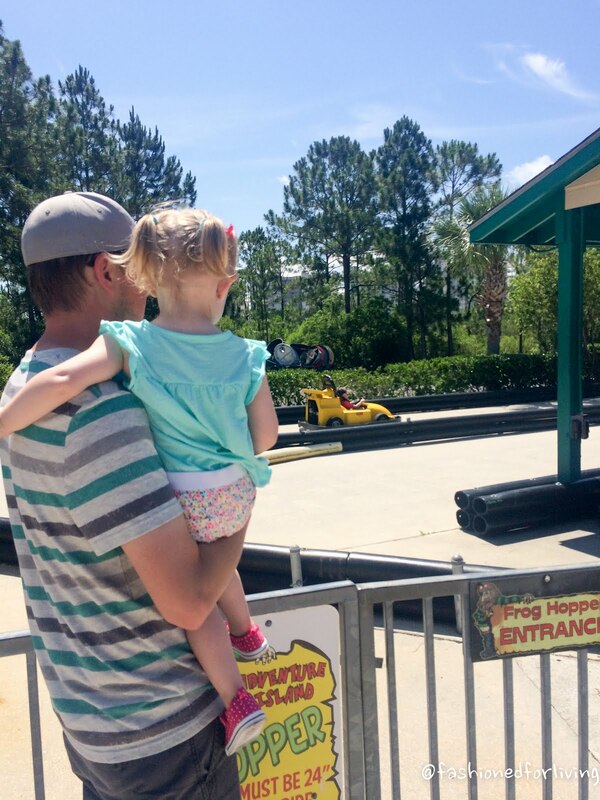 We made it back to the condo, and P.J., Everett, and my MIL walked across the street to Adventure Island to ride go carts and play games again. Elliot and I worked on packing up all our stuff. P.J. 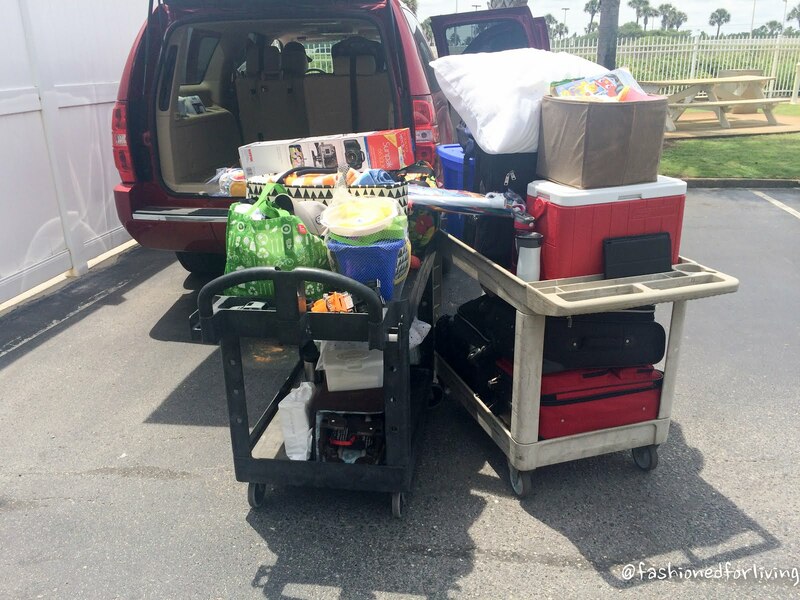 loaded the car when they got back with 99 percent of our stuff to be ready to leave early in the morning. First food stop on our way home was at Wendy's in Booneville, Mississippi. After eating we raced before piling back into the car. 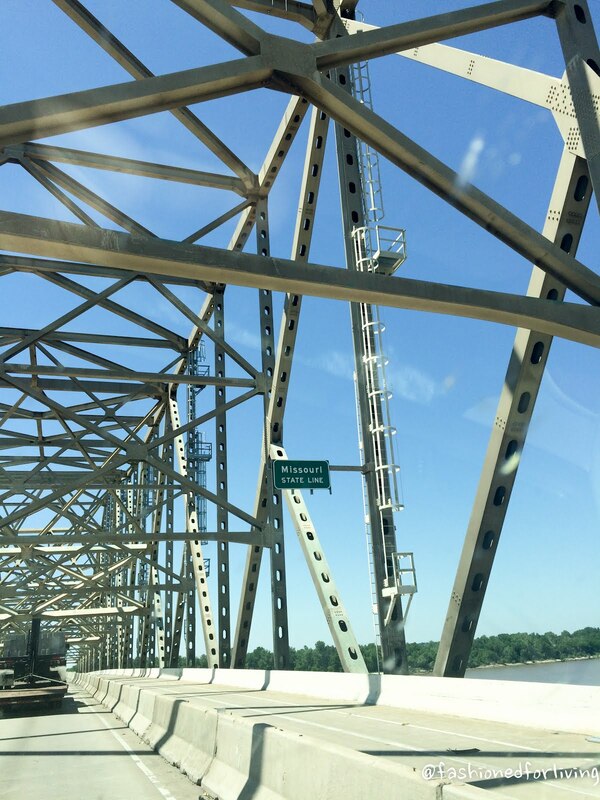 Crossing the line back into our home state of Missouri! 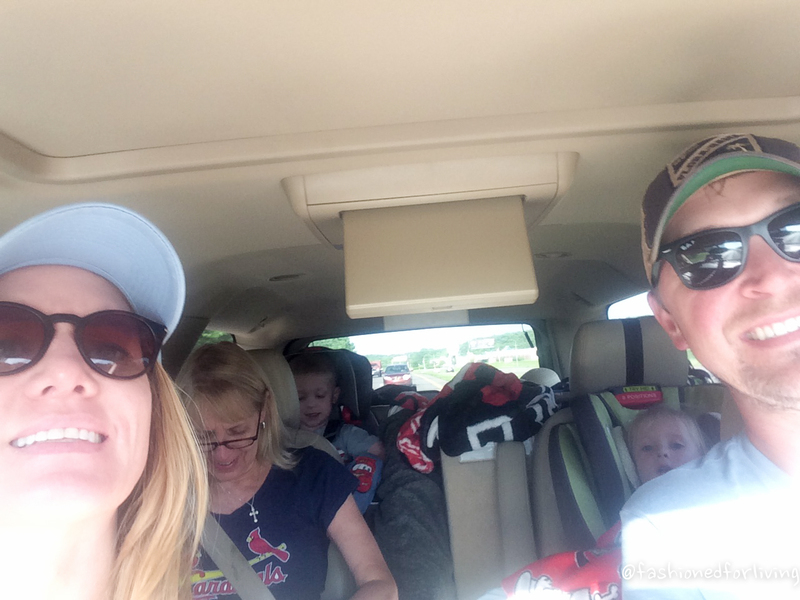 Made it to St. Louis and are almost home! Had to break out the DVD player on the way home, but we are all still smiling! Home. Sweet Home. 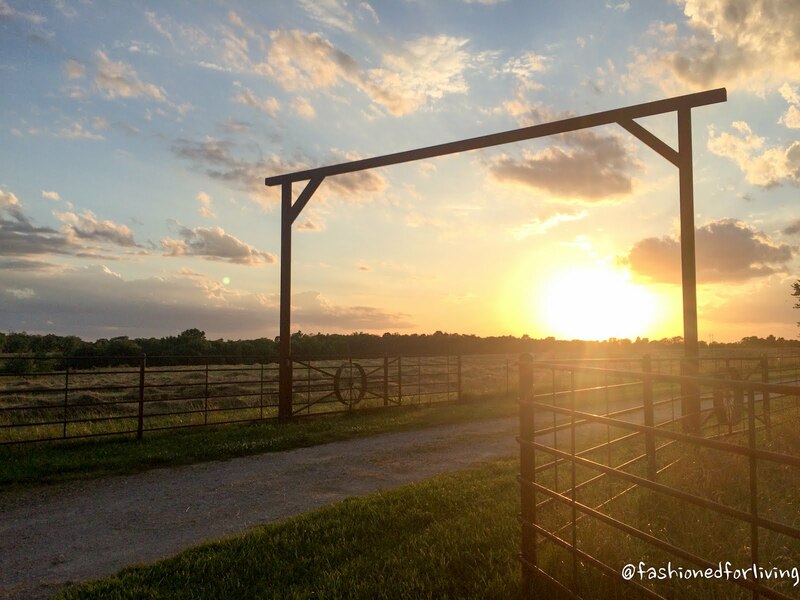 Pulling up to this view is not bad either! Hope you enjoyed and were able to get some helpful information out of this! 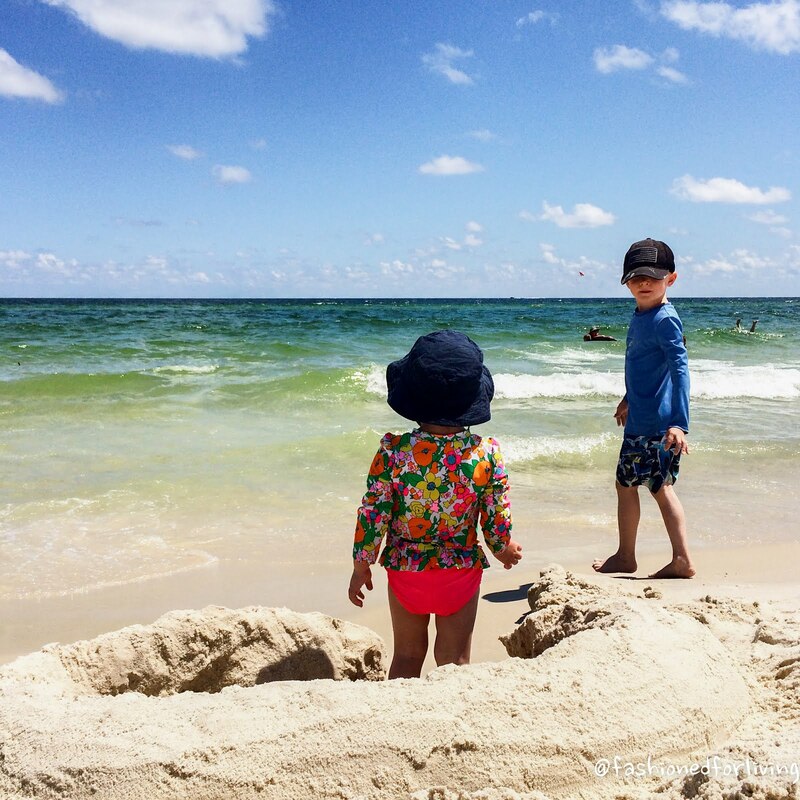 Have you visited Gulf Shores before? What's your favorite thing to do there? Be happy to answer any questions you may have! 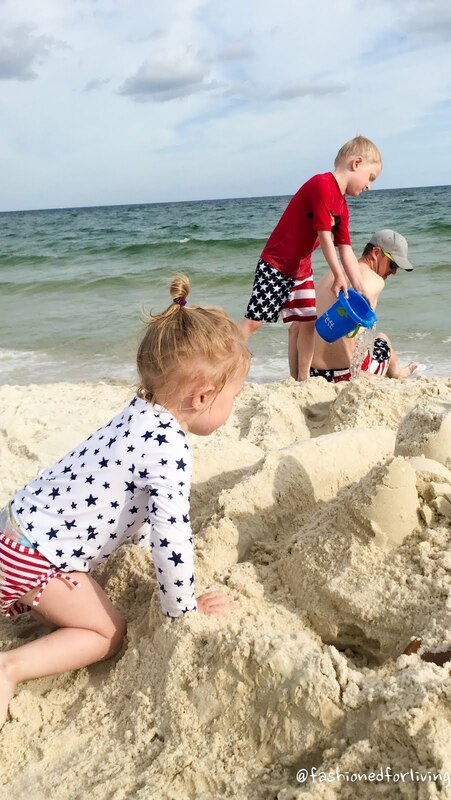 There are lots of other activities at the beach and surrounding areas to partake in, but we knew our babes were happy playing at the pool and beach mainly. 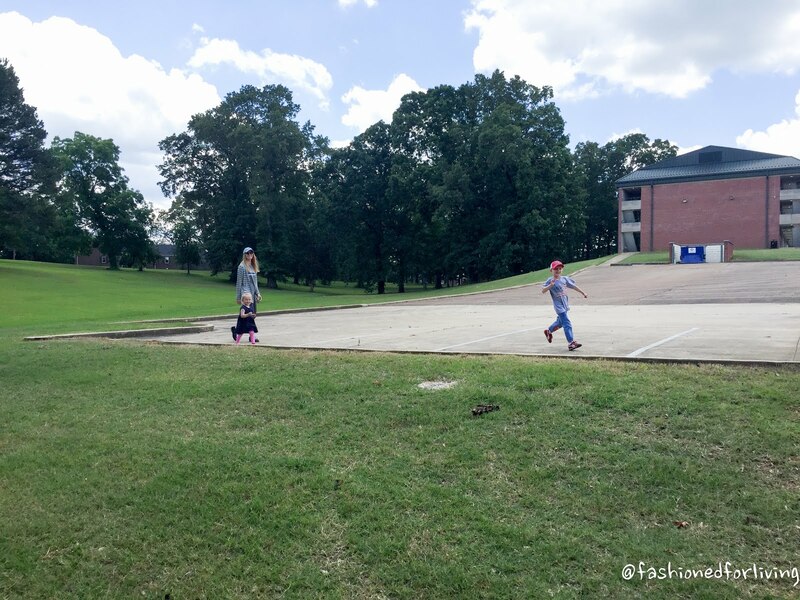 When they get a little older we probably will venture out more! Our condo was mostly original to when the condominium was built in 1984, but this depends greatly on the condo. Having two bathrooms was amazing! There was also a apartment sized washer/dryer combo. I didn't really think I would use it much, but boy did I! Having clean beach towels everyday was pretty nice! I was also able to wash everything we used before heading home. Once back I dumped everything out of the suitcase and straight into the dryer set to the refresh cycle. A few minutes of this and all of our stuff was ready to be put away! I saw so MANY people very sunburned, kids and adults alike. When spending so many days, all day, outside rash-guards are the way to go in my opinion. I have also found actually following the directions on sunscreen bottle also helps. Our routine is to apply a healthy amount in lotion form and letting that soak in a good 15 minutes before sun exposure. We seem to be able to get more even coverage with lotion vs spray. Then, reapplying ever hour or hour and half. It is pretty much impossible to use the lotion once covered in sand so spray is necessary. Sharing my outfit details (click) here. Thanks for stopping by. Audra.